Blog: Active Noise Cancelling | Avcomm Solutions, Inc. Noisy open offices can lead to unproductive and stressed-out employees ... and, unfortunately, this work environment is prevalent. Organizations should look to headsets as tools to bridge the gap and increase productivity in the workplace. 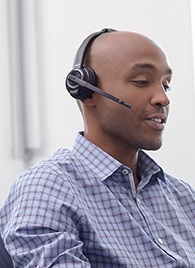 Headsets must meet the needs of employees (who need headsets that are comfortable, convenient, and cancel background noise) and their customers (who need clear conversations, every time they call) to achieve organizational goals. 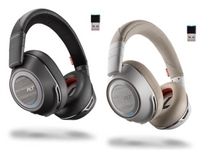 Plantronics' newest DECT wireless headset series, the Savi 8200, has been built for the human experience. The Savi 8220 features active noise canceling (ANC) that blocks out background noise so you can always stay focused on what’s important. 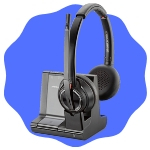 This is the first headset on the market that's designed with ANC for desk phones! 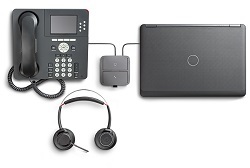 And, to further enhance collaboration and communication, these headsets also connect to PCs and mobile phones/tablets. 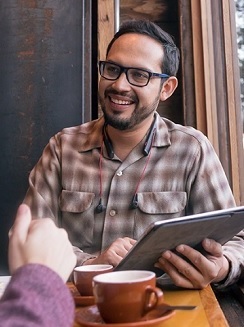 Count on Plantronics technology for rich, people-first collaboration experiences so good that ideas can be shared and heard—wherever, whenever and however they happen. With the noise-canceling mic, you’ll sound your best even in noisy environments. For the most sensitive environments, you can turn up noise canceling with the close conversation limiting feature (configurable in Plantronics Hub, free download here) for additional privacy. The mic boom is flexible, allowing for optimal placement: two finger widths away from the corner of the user's mouth. *13 hours of talk time! The Savi 8200 also comes in a single-ear variant, which does not have ANC. 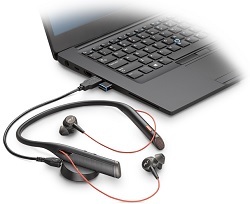 And, just like the Savi 8220 headsets, the Savi 8210 comes in UC and Microsoft versions for every user environment. 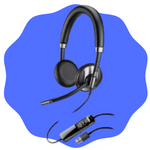 Is it time to reassess headsets at your organization? 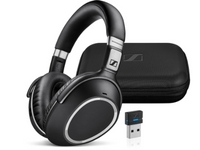 Are you looking for high quality professional headsets with superior sound? 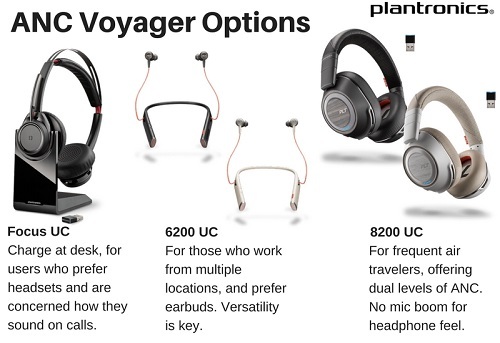 Take a look at the Plantronics Savi 8200 headsets, and call one of our headset experts today: 1-866-998-9991. 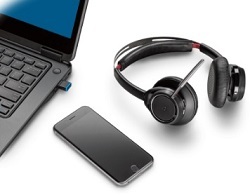 Active Noise Canceling is the trend that's taken over the business headset world. Professionals who require concentration and silence to perform tasks, who need a quiet environment to make and receive calls, will find benefit to the ANC headsets on the market. 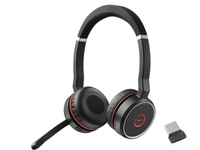 The Plantronics Voyager series is a well-known Bluetooth headset series often considered to be the standard in Bluetooth headsets. 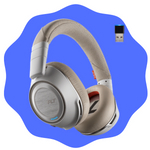 Reliable, comfortable, and always changing to meet the needs of consumers, Plantronics has listened to consumers, and has added Active Noise Canceling as a feature. Within the Voyager series are three ANC options, each with a unique role in the market that surely even the most demanding consumer will find a variant that meets their requirements and preferences. The Voyager Focus UC has a desk charging stand, and a traditional mic boom. 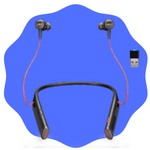 It is the most traditional looking headset of the three ANC options. On-demand ANC means that you can choose when to turn on the ANC, with a sliding ANC button on the bottom of an ear cushion.There is also a "Listen-In" feature that allows you to "drop in" to the environment with the touch of the ear cup, when the ANC is turned on, and then simply press the ear cup again to experience ANC. The comfort headband and the large, extremely soft ear cushions get rave reviews from users. MSRP is $299.95. If you prefer an earbud wearing style, the Voyager 6200 UC is the right choice for you. The padded neckband is lightweight and users usually forget that they are wearing it. 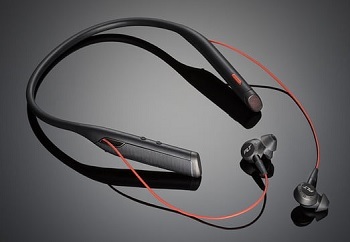 The neckband has some neat features: it vibrates to incoming calls; buttons on the neckband manage volume, mute, and ANC with buttons on the neckband. The four microphones at the end of the neckband form a mic array, for great pick-up and dynamic noise reduction. We are questioned about the ear buds: do they retract? 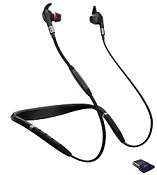 Is there a magnetic connector to connect the buds to the neckband? The answer to both questions is "no." The ear buds hang from the neckband. MSRP is $299.95. 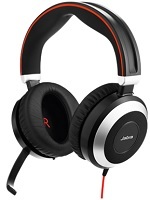 The Voyager 8200 UC has a boomless mic design, which makes this headset resemble headphones. Dual mode ANC lets users choose how much ANC is needed: either airplane level, or noisy office. Sweat and moisture protection comes from P2i military-grade nano-coating. 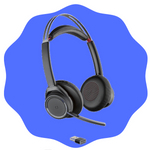 This headset gives you 24 hours of listen time and 20 hours of talk time! MSRP is $379.95. 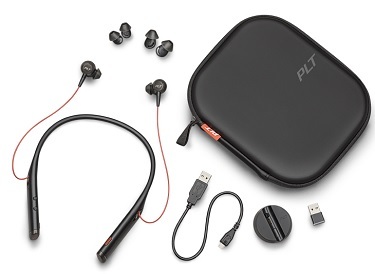 Plantronics signature audio, Dynamic Mute Alert, and the Plantronics Hub app (which brings additional functionality to your Plantronics Bluetooth headset with helpful tools, notifications, and status information) are just a few more reasons to consider a Plantronics Voyager headset. All of these headsets are "UC" versions: a BT600 Bluetooth dongle is included with each headset. Keep the dongle in your laptop port for always-ready PC connectivity. Not sure which headset you need? Contact us today and our headset experts can help.